An exhibition of bold landscape paintings by noted local artist Carol Lindemulder will open Saturday at the San Diego History Center in Balboa Park. The exhibit features a selection of oil paintings, dating from 1996-2018, that highlight the artist’s dedication to recording the beauty of Southern California’s deserts, fields, mountains, buildings and towns. 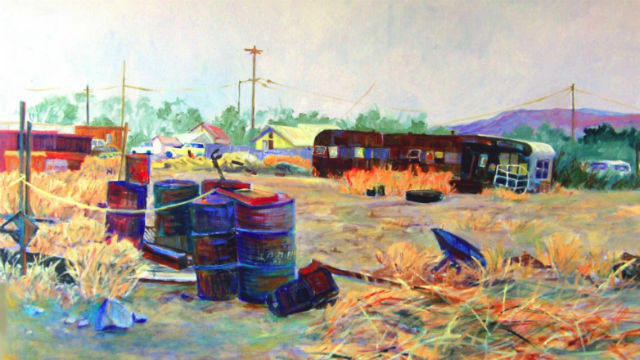 “Carol documents the beauty of the San Diego region through her keen eye and bold use of color. She carries on the tradition of our region’s masters in painting the beauty of the landscape,” said Bill Lawrence, the history center’s executive director and CEO. Lindemulder was born and raised in San Diego, studied art and design at UC Berkeley and San Diego State University, and now lives and works in Borrego Springs. The exhibit runs through May 5 . The museum in the Casa De Balboa is open from 10 a.m. to 5 p.m. daily.